Typically when people discuss Native American art they are referring to peoples in what is today the United States and Canada. You might sometimes see this referred to as Native North American art, even though Mexico, the Caribbean, and those countries in Central America are typically not included. 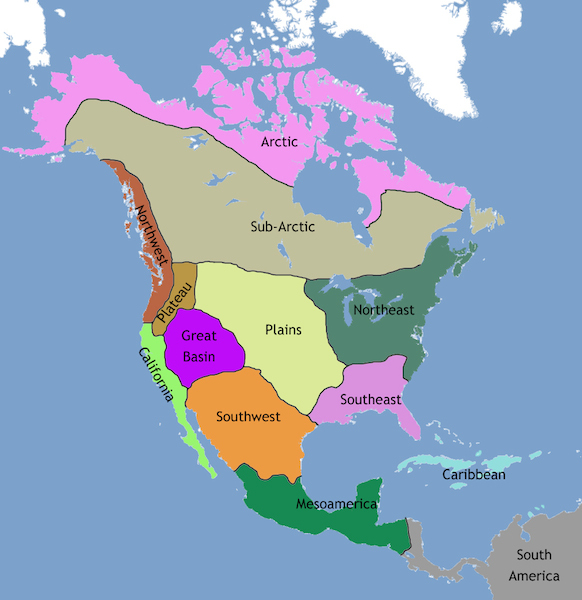 These areas are commonly included in the arts of Mesoamerica (or Middle America), even though these countries are technically part of North America. So how do we consider so many groups and of such diverse natures? We tend to treat them geographically: Eastern Woodlands (sometime divided between North and Southeast), Southwest and West (or California), Plains and Great Basin, and Northwest Coast and North (Sub-Arctic and Arctic). While this is by no means a perfect way of addressing the varied tribes and First Nations within these areas, such a map can help to reveal patterns and similarities. Chronology (the arrangement of events into specific time periods in order of occurrence) is tricky when discussing Native American or First Nations art. Each geographic region is assigned different names to mark time, which can be confusing to anyone learning about the images, objects, and architecture of these areas for the first time. For instance, for the ancient Eastern Woodlands, you might read about the Late Archaic (c. 3000–1000 B.C.E. ), Woodland (c. 1100 BCE–1000 C.E. ), Mississippian (c. 900–c. 1500/1600 C.E. ), and Fort Ancient (c. 1000–1700) periods. But if we turn to the Southwest, there are alternative terms like Basketmaker (c. 100 B.C.E.–700 C.E.) and Pueblo (700–1400 C.E.). You might also see terms like pre- and post-Contact (before and after contact with Europeans and Euro-Americans) and Reservation Era (late nineteenth century) that are used to separate different moments in time. Some of these terms speak to the colonial legacy of Native peoples because they separate time based on interactions with foreigners. Other terms like Prehistory have fallen out of favor and are problematic since they suggest that Native peoples didn’t have a history prior to European contact. We arrange Native American and First Nations material prior to c. 1500 in a separate section which includes material about the Ancestral Puebloans, Moundbuilders, and Mississippian peoples. Those objects and buildings created after c. 1500 are in their own section, which will hopefully highlight the continuing diversity of Native groups as well as the transformations (sometimes violent ones) occurring throughout parts of North America. Artists working after 1914 (or the beginning of WWI) are located in both the Art of the Americas section, and in the modern and contemporary areas. Janet Catherine Berlo and Ruth B. Phillips, Native North American Art, 2nd ed. (Oxford: Oxford University Press, 2015). Brian M. Fagan, Ancient North America: The Archaeology of a Continent, 4th ed. (London: Thames and Hudson, 2005). David W. Penney, North American Indian Art ( New York: Thames and Hudson, 2004). Karen Kramer Russell, ed., Shapeshifting: Transformations in Native American Art (New Haven: Yale University Press, 2012). Cite this page as: Dr. Lauren Kilroy-Ewbank, "About geography and chronological periods in Native American art," in Smarthistory, January 21, 2016, accessed April 22, 2019, https://smarthistory.org/about-geography-and-chronological-periods-in-native-american-art/.